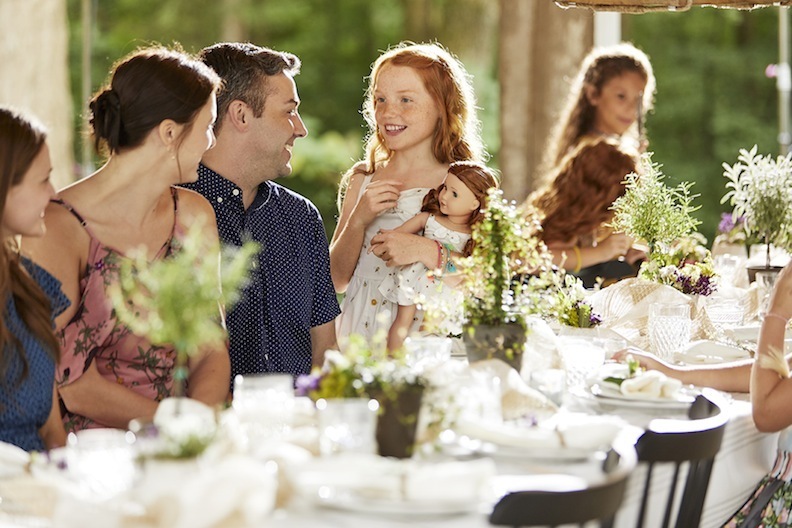 Easter dinners and spring get-togethers are the perfect showcases for American Girl dolls and accessories. Easter Sunday is almost upon us — April 21, to be exact — and spring has finally sprung in most states around the nation. The beastly cold and ferocious freeze that dominated most of our daily weather reports has now melted away. 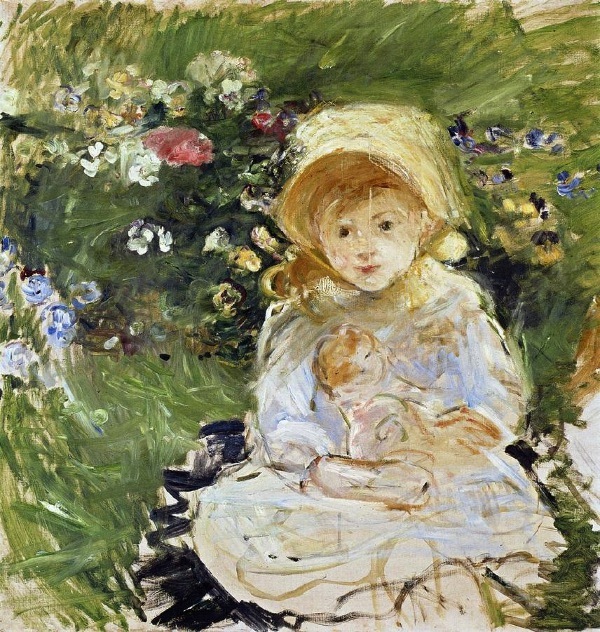 The world is abloom, and the opportunities to share dolls with every member of the family is certainly here. 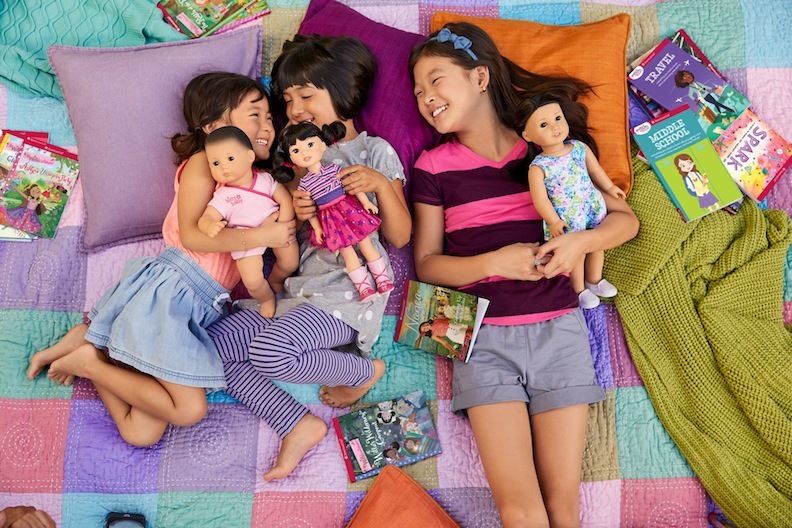 American Girl has made a true effort to turn doll playing into family memories. Frequently, children play with their toys and dolls alone. This spring, American Girl wants to bring mothers and daughters, along with fathers and siblings, into their doll world. For Easter and the rest of the spring season, American Girl has products, events, and suggestions to make every home a happy, healthy one! Many dietitians and nutritionists cringe when they think of Easter. They are worried about the high-calorie chocolates, Peeps (is that even a food group? ), and rich ham dishes that pop up on that special day. Rather than assisting the Easter Bunny in his hiding of eggs and candies, why not spread some doll love, instead? American Girl has a new lineup of clothing for girls, doll costumes, books, and playsets that celebrate the wonders of good weather and hard work. 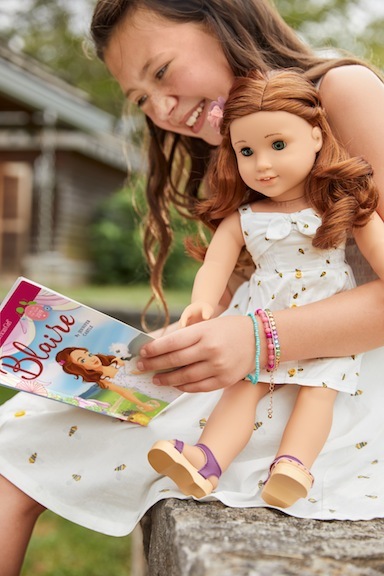 Their 2019 Girl of the Year doll, Blaire, is all about her family farm, her family restaurant, and reconnecting with her family. Just in time for Easter, American Girl is launching merchandise that celebrates that viewpoint. Blaire’s Garden Set is an American Girl spring or Easter treat. Blaire, who dreams of becoming a chef and restaurant owner, has a deep connection to the earth. In spring, her family’s land erupts in a wild palette of beautiful colors and edible plants. For Easter, American Girl is unveiling the “Blaire’s Garden” vignette. Priced at $50, the garden structure contains pretend soil, holes for an interchangeable set of plants to grow, plant markers, and a removable nesting box for chickens. It also includes Blaire’s favorite chicken, which is named Dandelion, and her nest (complete with eggs). A shovel, watering can, and basket complete the springlike set. American Girls is synonymous with Easter happiness. Because she lives on a farm, Blaire is in touch with agricultural demands and the necessities of caring for animals. Besides tending to the vegetable patch and harvesting the crops, Blaire has adopted one of the little lambs from her neighbors’ farm. She has turned tiny Penelope into her pet. Parents and grandparents can surprise their animal-crazy children with American Girl’s plush version. Tagged at $25, Penelope has a curly white fur, an embroidered face, and a ribbon collar. The collar is accented with flowers that Blaire grew. The American Girl lamb is an ideal Easter gift. The American Girl Family Restaurant is a sprawling, beautiful creation. It is the ideal location for an Easter doll meal or other family gathering. Perhaps you want to have Christmas come early this year? Or maybe American Girl will sway you to present a super-deluxe gift for Easter, instead. “Blaire’s Family Farm Restaurant” is a sprawling, beautifully made tableau. 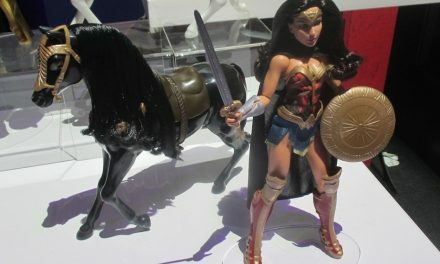 It has a price tag of $300 and is designed for collectors aged 8 and up. The restaurant is simply magnificent. It comes with cabinets, stoves, cookware, plates, cutlery, and tableware. It also contains a glorious assortment of food: Caprese salad, fettuccine, salmon, bruschetta, cakes, ice cream, and a gourmet baked pumpkin with a fried egg inside! After all, Blaire’s family restaurant provides high-end food with quality ingredients. The restaurant even has a reversible floor. On one side, it has a dance floor, and on the other, it has faux grass. The American Girl design team has made this an Easter and spring sensation. As pretty as a picture! You bet! The matching spring/Easter dresses are from American Girl. Dolls and girls can mirror one another. If, indeed, the restaurant is a gift that you plan to save for a later date, American Girl has creations that cost far less. The clothing ensembles are always crowd-pleasers. The “Simply Spring Outfit” for 18-inch dolls sells for a reasonable $28. The matching “Simply Spring Dress” for girls is $50. The floral-print dress, with attached satin sash, comes in sizes 6 to 16. The Bitty Baby Doll, which is ideal for toddlers aged 3 and up, also has a line of spring clothing. Its “Sweet Spring” ensemble is also priced at $28. Little girls who want to match their Bitty Baby can ask the Easter Bunny to tuck away their complementary outfit. Available in sizes 3 to 6, the little girls’ dresses are $42. American Girl is determined to make Easter Sunday and all spring weekends extra pretty and wholesome. “Let your mind bloom” is Blaire’s motto and American Girl’s mantra, too! In addition to holiday best, American Girl has also created comfortable pajamas inspired by Blaire and her storyline. In sizes XS to XL, “Blaire’s In Bloom PJs” are soft purple tees with short flutter sleeves. The motto “Let Your Mind Bloom” is on the T-shirt’s front. A cute pair of white shorts, with a ruffled edge, completes the adorable look. Any real-life American girl can identify with the 2019 American Girl doll. Eco-friendly and environmentally concerned, the Blaire doll and her collection are perfectly suited for Easter and spring. Some more pajamas from American Girl! These S’More PJs really rock! “S’more Fun” pajama sets are also available for both dolls and girls. These appeal to kids who love the allure of the great outdoors. Everyone loves campfires, telling ghost stories, and toasting marshmallows. The “S’more Fun” PJs are priced at $24 for the 18-inch doll versions. The human styles are $40 and fit sizes XS to XL. For Easter and spring, American Girl offers quality interaction between girls and their dolls. Beyond the books, the dolls, the clothing, and the accessories, American Girl also has family-bonding experiences. Their headquarters in New York City at Rockefeller Plaza is especially hopping with Easter and spring activities. The “Doll Hair Salon Spectacular” seems to be an extremely hands-on event. 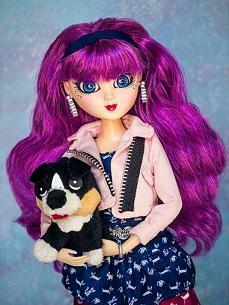 Girls will learn how to style and maintain their dolls’ tresses. It is happening on April 27, May 5, and June 29. The “After-School Book Club” is hopping on April 25, May 9, and June 6. Held from 4 to 5:30, the event includes fun crafts, tasty snacks, and conversations about the books that will be read together. Attendees will return home with a goody bag. Spring is bursting with fun and educational opportunities. American Girl publishes a large array of inspirational fiction and factual books, too! 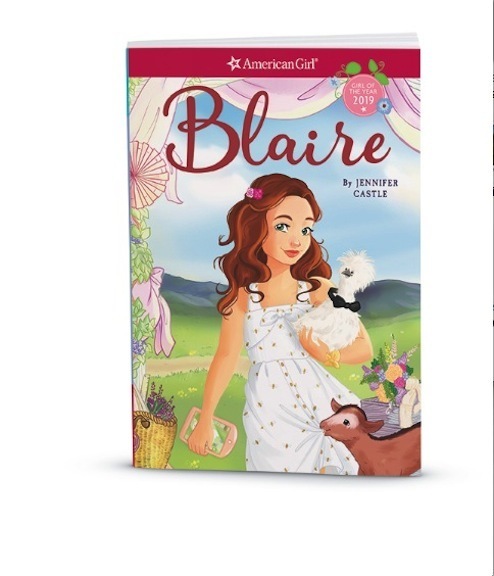 Naturally, because Blaire is the American Girl of the Year, the retail gatherings include activities that are celebrations of her personality and charms. There are “Cookie Decorating” events, which are drop-in and cost $10 on the day of the event. After learning how to decorate cookies that are shaped like flowers, chicks, and pigs, the girls will leave with take-home boxes of their finished confections. After school, throughout Easter, spring break, and summer, real-life American girls can have fun and educational times with their dolls and family. There are “Teatimes with Blaire Wilson,” slated for April 28, May 12, May 26, June 16, and June 30. The “American Girl Bunny Brunch” (an Easter festival for sure) is on April 20. The “WellieWishers Friendship Tea Party” will be held on May 19 and June 23. With “After School Movie & Pizza Nights,” crafts meet-ups, and visits to Broadway shows, American Girl is expanding its reach. Loving live theater and girl-power stories, American Girl is attending “Wicked” on July 24. That will be an action-packed theater outing. 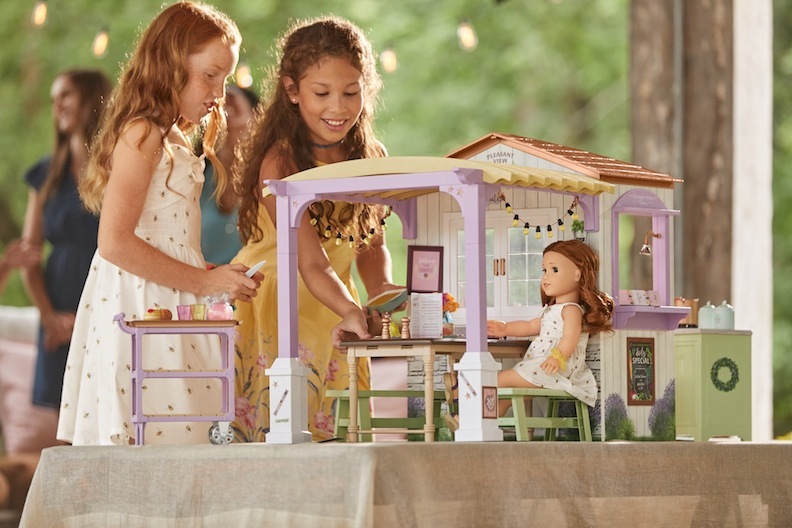 Easter, spring, and summer are alive with American Girl activities. Families have a chance to share in their daughters’ playtime by turning it into “getting to know you” time. Visit the American Girl website to find out about retail happenings at a store or location near you.